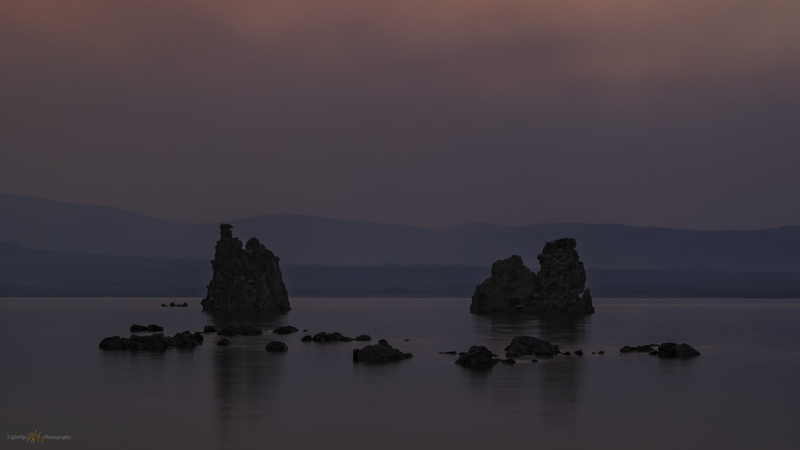 A long exposure as early darkness set the mood at Mono Lake Tufa State Natural Reserve. 2.0 sec, f/11, ISO 100; Canon 5DmIV, 17-40 mm. It was time to take advantage of a break in the work routine. The summer monsoons had recently encroached on the Pine Nut Mountains above StoneHeart, so maybe there would be some dramatic clouds and lightning to chase. Or, the exhausting California fires would continue to pour smoke onto the eastern Sierra, creating another saturated sunset. I checked my radar apps all afternoon but the bright red blobs of the past few days were absent, and only a few yellow-level squalls bloomed momentarily and then scurried away in the afternoon heat. Nothing to chase in those. But I saw cumulus remnants in the direction of Mono Lake, so I steered south-bound on Highway 395 – a little later than I planned – with the goal of wandering among the near-shore tufa formations at the Mono Lake Tufa State Preserve. Smoke from the Ferguson Fire, the one that closed down Yosemite National Park for at least this week, should add some character to photographs of the tufa. It is always a good drive through the Walker River Canyon. The drive was relatively quiet this evening, probably due to the smoke-filled skies keeping tourists away. I notice once again several outcrops and exposures along the canyon that could make splendid compositions in the right light and with the addition of some low-hanging clouds or a back-drop of fog. I will have to plan for that. The Reserve basically circles the lake, and with the light fading fast, I dropped in to the easy access of the Old Marina parking area just north of Lee Vining. It isn’t the most dramatic tufa on the lake, but there are plenty of outcrops and towers – some with nesting Osprey – where one can find a composition or two. I dropped the three-dollar fee into the bin, grabbed my pack, and hiked out the boardwalk. I could see a group of hunched-back photographers at the distant end of the boardwalk, a workshop almost certainly; only a couple other photographers strayed from the cluster of tripods. 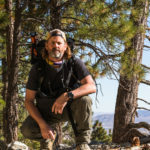 With a happy hello – they did seem to be composing their images at the prime and fleeting moment of the smoky sunset – I circled away from the small crowed, eastward, off-trail among the sedges and flat-lying tufa mounds. It was getting dark fast, but I liked the darkening mood as the last light saturated the smoke and blurred the horizon. Looking back, I noticed the group had departed, but a lone photographer remained, and for some reason he seemed to be composing his shot where I would be in the frame. I did not notice anyone working this direction when I passed by. I hope I’m not ruining his composition, or maybe he wants me for scale. I am, as yet, unaccustomed to wandering among landscapes with other photographers in them. My feet were soaked and I’d stumbled into some deeper shoreline bogs here and there. But I’d found what I hoped for. Wading into knee-deep water, I picked out a tear-drop shaped rock leading to a set of tufa towers under a fiery, glooming sky. I set up a wide, vertical composition to get the low dynamic range, with hints of saturated color, from sky to foreground. I took a few images in case I needed to focus stack, but I ultimately liked my first image (below). I waited into the blue-hour and the smoke settled into red-to-pink pall as I zoomed to the middle-ground towers to get them in the mirror of sky and water (banner photo above). As I was packing away my gear, a large coughing or huffing sound echoed from a nearby outcrop. I froze for a moment as the sound repeated itself. Where and what was it? It was strangely loud for being invisible, though it was practically dark. And then two large deer bounced from behind a tufa block, pogo-sticking through the grassy wetland of the nearby shoreline. Cool. Smoke at sunset over Mono Lake tufa formations. 2.5 sec, f/20, ISO 100; Canon 5DmIV, 17-40 mm. I returned to the lone photographer at the boardwalk and apologized for possibly crossing into his image. He had no concerns and was merely waiting for the full moonrise. I set up to wait with him, trying to capture the red, smoke-tinted orb. I had no luck, having not practiced much on the puzzle of the quick orbiting moon in a long lens with little or no foreground. It was an awesome sight, however. I left for the highway and turned toward home, where it would soon be midnight. I processed the two images shown here to capture the mood of the smoke-filled basin and subdued lake in the coming night. The images are dark and saturated, captured after the heat of a long day as the destructive fires weigh on our minds and we cannot yet see the season’s end. Connect here for Full Image Gallery.